Blogger is the best platform to start a professional blog. Many big blogs are hosted on blogger it's not because it's a free service it's because of reliability and unlimited benefits. You get different features like a free template, unlimited hosting, unlimited bandwidth and trust of google secure system. Today we will talk about how to start a blog? and how you can monetize your blog content?. 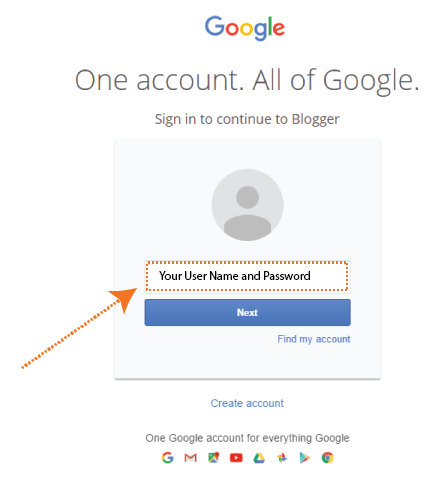 If you have a Gmail account then you can directly sign in to blogger and if don't have then make one. Go to Blogger.com and click Sign in. Then you need to add your user details e,g Username, and Password to sign in to blogger. After successfully signing in to the google account you will be redirected to the blogger user panel of your blog where you can check stats of your blogs, earnings and do modifications in layout panel on your blog to make it look professional. 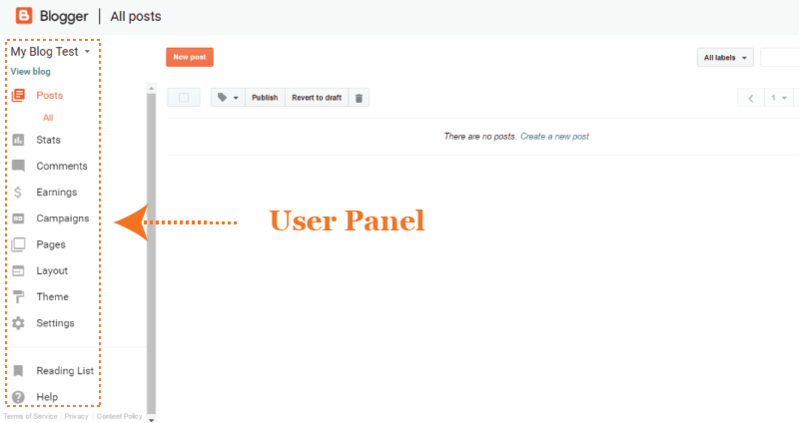 Now click on the New Blog in user panel to start a new blog. Now you will see a pop-up window requiring your desired blog address, blog title, and your desired blog theme. Your blog title is what you are going to offer on your blog and your blog address should be similar to your blog title e.g, title ''Food Recipes Online'' blog address'' Foodrecipes.blogspot.com. After putting blog address and title the next step is to select the blogger theme.Chose any of the themes in default blogger theme explorer, it is not the permanent theme we can change it later. After selecting the theme click on Create Blog and you are done! You have successfully created a new blog. Custom domain name is the key to a start a successful blog. The default blogger address looks like"yourblog.blogspot.com" and when you buy a domain name it gets changed to "www.yourwebsite.com" and increase the authority and reputation of your blog.The best place to buy a domain name for your blog is Godaddy, I recommend Godaddy because It is cheap reliable and easy to install on your blog. After successfully buying a domain name on GoDaddy the next step is to add the custom domain name on blogger.Follow the below steps to successfully add a custom domain on blogger. Choose the blog on which you are willing to add the custom domain name and the click on Settings > Basic in the layout menu and then click on the ''Set up a third party URL for your blog'' button as shown in the pic below. Now you will see an URL box asking your domain name on which you want your blog to be transferred and make sure to add ''www'' before your naked domain e.g, "yourdomain.com" is the naked domain your URL should be "www.yourdomin.com" after adding your domain name click on save as shown below. After clicking on Save you will see an error of updating the DNS records on your registrar's website e.g, GoDaddy. You will see two random records to be updated on domain DNS settings.Copy both records and save for later use. Now you have to sign in to GoDaddy and update the DNS records. 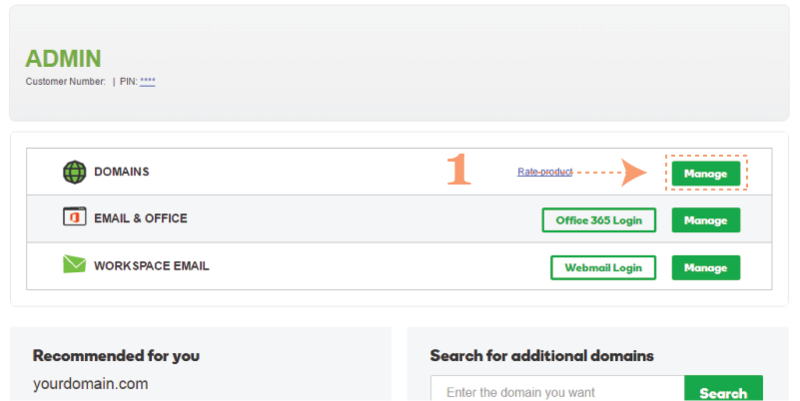 After signing in to GoDaddy click on Manage in Domains sections of your Godaddy Account. You will see domain panel where all of your domains are located. Now select the drop down menu in the corner of your desired domain on which you to redirect your blog.You will see two options after clicking on the drop down, click on Manage DNS. After clicking on Manage DNS you will see DNS Management panel and a list of default DNS Records. You have to delete all the highlighted records one by one before adding new records. For deleting a record simply click on the pencil icon at the end of each record and the click on the bin icon to delete the record as shown in below picture. Repeat the same for the rest of records. After deleting the records you have to put new records to your DNS database. There are two records that you are supposed to update one is '' CNAME'' and Second '' A '' records. CNAME Records are provided by the blogger that you have recently saved from blogger website. There are two fields in CNAME Records (1) Name, Label or Host field (2) Destination, Target or Points To field. First, we will add CNAME records for which purpose you have to click on ''add'' in the bottom of records panel and select CNAME From Drop down menu shown in the pic below. Now you will see two empty fields '' Host'' and ''Points To'' add ''www'' in the ''Host'' field and '' ghs.google.com'' in ''Points To'' field.This record is same for all blogger blogs. The second record is unique and has to be added the same like the first record as shown in the pic below. For adding A Records you have to repeat the same process shown above. Select ''A'' in type dropdown and then add ''@'' in the Host field and ''216.239.32.21'' in ''Points To'' field and click save. Repeat the same for all four records. 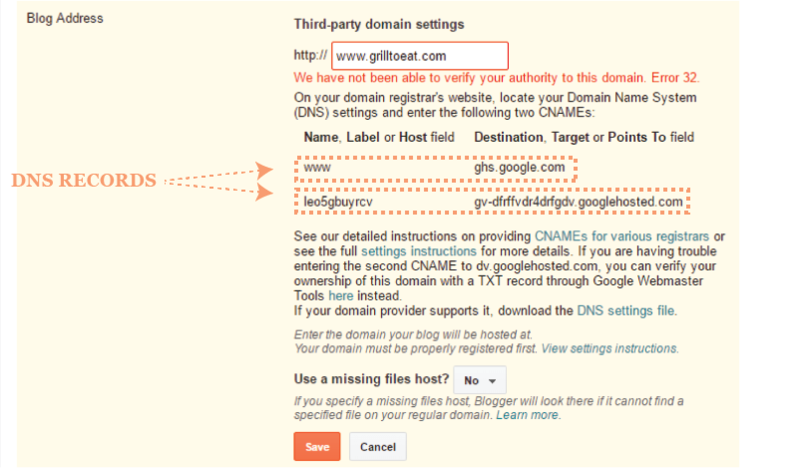 Now go back to the same panel in the blogger where you faced the error while saving your domain name. Add the domain name once again and click Save, this time domain name will be saved successfully if you have followed the above steps correctly. Click on edit and check the check box shown in the picture below and click save. Blogger template is the most important thing to have a professional and successful blog. There are many online sources to download free blogger templates e.g, Btemplates, GoyaabiTemplates etc. After downloading the template the next step is to upload the template and start posting articles.Follow the below steps to upload blogger template. 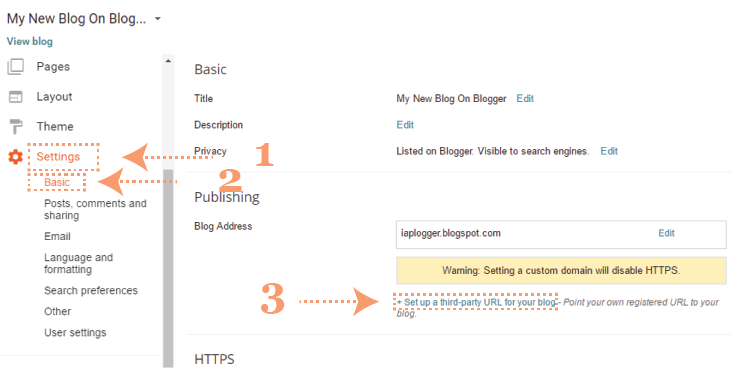 First, you need to select the blog on which you want to upload a template. 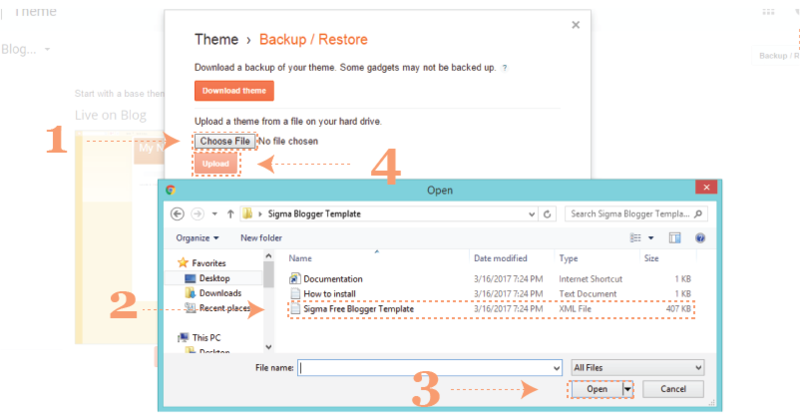 Now click on Theme and then you will see Backup / Restore option in the right upper corner click on it as shown in the fig below. Now you will see a pop-up box after clicking on Backup / Restore option. Click on Chose File and the windows explorer will pop-up find your downloaded XML file in windows explorer. After selecting your XML File Click Open and then Upload as shown below. After Clicking on Upload you template will be published and live. After uploading the blogger template you have to do small modifications on your blog.If you have downloaded complete template there will be an easy guide for you to do minor and major modifications on your blogger blog.There are different areas of your blog where modification is required e,g. Changing Main Header Tab Names, Creating Static Pages, Editing Side Bars etc. Social Media is the best way to promote your content online and to make your blog successful.First, you have to create a page on facebook or twitter or any platform you are aware of. I would recommend using facebook because these days facebook is the biggest marketplace in the world.Follow the steps below to make a page on facebook to share your blog content online and boost traffic. The purpose of a blog in a point of view for all bloggers is to make some revenue online for a living and become successful. Blogger blog could be a successful online business.To do so your blog should meet the requirement of many online advertising companies. It should be full of traffic, rich in quality content and have tons of readers. There are many online advertising companies that are supporting small bloggers to earn some revenue and pay back all their efforts they have carved in their blog.The best advertising program is google advertising program. You should check if you are eligible to apply for google advertising program and start earning revenue from your blogger blog. In this ultimate guide of how to create a blog, you would have started a blog on blogger If it helped you please share it with your friends and family because sharing is caring and they should also know about how to start a blog.